Green clad mountain rising literally to a height 2000 ft. and dominating the surroundings landscape is Pachamalai. Pachamalai literally mean Green Mountain. A few 3000-foot-high cliffs and vales dotted with green pastures and rustling streams add more charm and verdurous elegance. Innumerable medicinal herbs, plants and a good variety of pods and flowers astonish the visitors. Pachamalai is in the shape of the glass the length of which 20 km the ghat road taking the start from Shobanapuram at the foothill with 11 hairpin bends is enjoyable-the road is well maintain and visitors sight the valley views 3 km down the ghat road. The unique features of the Pachamalai are that the hill is the preserve and conserve of the original inhabitants at bay. 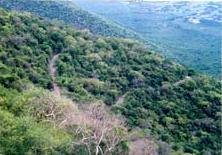 Pachamalai is the only hill tourist centre that the people of this area and tourist can visit. This entry was posted in Pachamalai, Tamil Nadu. Bookmark the permalink.